We take a look at four out of twelve candidates to join MLS in upcoming years. Let’s see if Phoenix, San Diego, Raleigh and St. Louis have news for us! During the recent Stadium of the Year we haven’t followed MLS developments well enough due to lack of time. Now it’s time to give you some updates on how various cities and ownership groups are shaping up their MLS bids. The race is still at relatively early stage before we know the 2020-2022 expansion teams, but there’s significant movement. Let’s see four out of the twelve candidates. Phoenix Rising FC begin their 2017 USL campaign on Saturday, opening their brand new stadium. What?! When, how? Well, they managed to build it in just 2 months with their own funds, providing seats for 6,000 people. Should demand grow, there’s potential to increase it to 10,000 during the season. 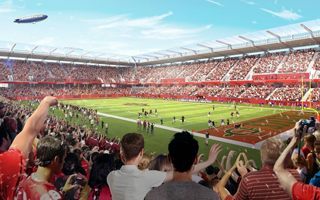 On Monday the San Diego State University (SDSU) officially issued a proposal to buy (or lease for 99 years) 47 acres (19 hectares) of land in Mission Valley to become part of the FS Investors’ megaproject. SDSU hope to expand their campus and find a new home for their football team. While majority of their crowds would fit in the already proposed 30,000-seater for MLS, SDSU is reportedly much more inclined to have 40,000 available for their games (35,000 initially, with room for expansion). The university wants to control all rights to all collegiate sporting events at the stadium. Their bid has no mention of sharing the stadium with any MLS team, which suggests we may be in for negotiations between all interested parties. In case you haven’t followed this project, FS Investors proposed to completely redevelop the Mission Valley area, where Qualcomm Stadium currently sits. They want to deliver 480 units of on-site affordable housing, 800 units of on-site student-focused housing and 3,520 units of market rate residential. The plan has room for football in all three most popular iterations: MLS, NCAA and NFL. Now it’s a matter of building the best feasible plan, most likely without NFL after Chargers confirmed their relocation to Los Angeles. Missouri: Community benefits by SC STL, are they convincing? On April 4 voters in St. Louis will be asked to decide on two propositions. They both need to pass if SC STL (ownership group hoping for an MLS spot) are to build their stadium. Proposition 1, if approved, would allow for a half-cent sales tax increase to pay for a MetroLink expansion, while Proposition 2 would permit an increase in the business use tax to help cover the city’s contribution ($60 million) to the stadium. In order to convince residents of St. Louis, SC STL have this week released their Community Benefits Agreement. It includes plans for SC STL to partner with workforce development organizations, provide funding to youth soccer programs in the region, donate equipment to city schools, guarantee community appearances from team members throughout the season, and to hold youth soccer camps throughout the area. North Carolina FC begin their 2017 season this Saturday. Their current home is WakeMed Soccer Park, able to hold up to 10,000 people. That’s exactly the target crowd size for Saturday, which is then hoped to be repeated during the season. Of course that’s not anywhere near the required size for MLS, but as of now there is no solid plan of where the team would play if granted permission to join the league. The team is still looking at three sites, one of which would be expanded WakeMed. But the process takes time because of dealing with government entities. A downtown Raleigh stadium, which would put the team in the middle of the millennials NCFC wants to attract, would make sense but would require cooperation from multiple sources.